A colorful assortment of fresh fruits, jelly and custard, this dessert is a treat for the eyes and the taste buds. Quick and easy to make, this yummy dessert can be served after any meal. Loved by kids, sweet custard without fruits and jelly can be fed to infants as well. Boil 1 cup water in a saucepan. Then turn off the gas and dissolve the jelly powder in it. Ensure that no lumps are left. Pour the jelly mixture in a square dish or bowl and place it in the fridge to allow the jelly to set. Let it stay in the fridge for at least 20 minutes. If the jelly is not set after this time, let it stay in the fridge for a little longer or keep the dish in the freezer for 5 – 10 minutes. While the jelly sets make the custard. For this, pour 2 cups milk in a medium sized deep pan and place the pan over medium heat. Add the sugar to the milk and stir gently. Let it come to a boil. Dissolve the custard powder in the remaining 1/2 cup milk. Ensure that the powder gets dissolved completely since it tends to stick to the spoon. As soon as the milk and sugar mixture starts to boil, reduce the flame and carefully pour the dissolved custard mixture into it while stirring continuously. Stirring makes sure that the final consistency of the custard is smooth without any lumps. While stirring increase the flame slightly and keep stirring till the custard begins to thicken. Turn off the flame as soon as it thickens to your desired consistency. Pour the custard into a bowl. Let it come to room temperature. Then put the bowl in the freezer for about 15 minutes to cool it. Meanwhile, remove the set jelly from the fridge and cut it into square pieces by inserting a sharp knife into it while it is still inside the bowl. Also keep the chopped fruits ready. Arrange a layer of chopped fruits at the bottom of your serving dish. Then top it with a layer of chilled custard and then repeat this till your reach the top of the bowl. For the final layer place a few pieces of chopped fruit and lots of pieces of cut jelly on top (you will need to scoop out the cut jelly pieces from the jelly bowl using a spoon or knife tip). 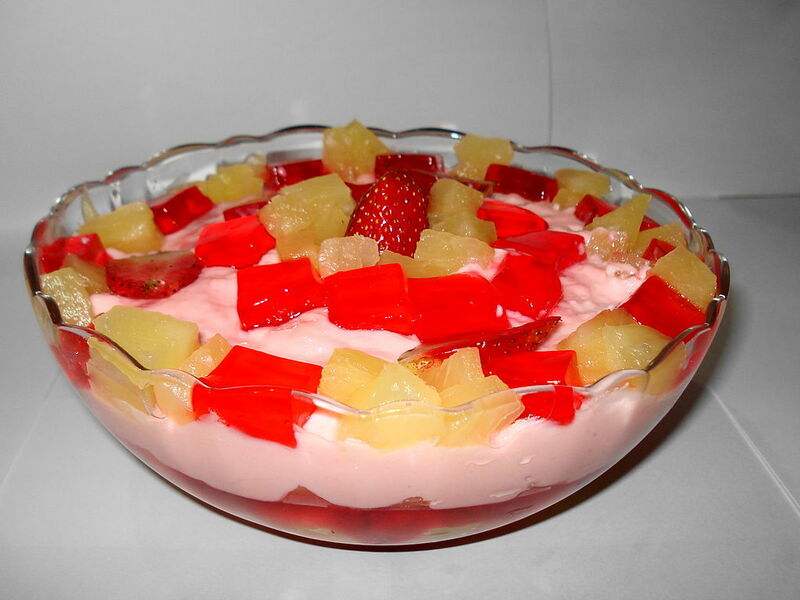 Serve chilled fruit and jelly custard as a dessert after a yummy meal. Tip: You can use any combination of custard flavor and fruit. Vanilla custard, chopped mango and sliced grapes make another great combo.